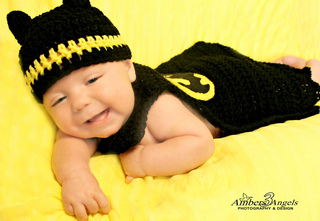 This is a 3-6 Month sized batman cape, logo, and hat. Easy-to-follow pattern with lots of illustrations. The cape is constructed to fasten around the neck in whichever way you choose (button, velcro, magnet), and the logo can be made either with black felt (template included) or black yarn. You will need two yarn colors, black and bright or golden yellow (you can also do pink for a little girl, or blue, or green, or probably any color that you’d like). 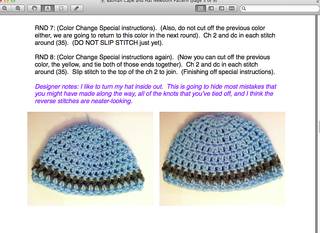 I do give permission to sell the finished products so long as I get credit as the pattern designer. 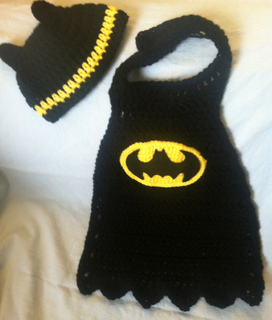 I am in no way affiliated with DC comics, this cape and hat is batman inspired.